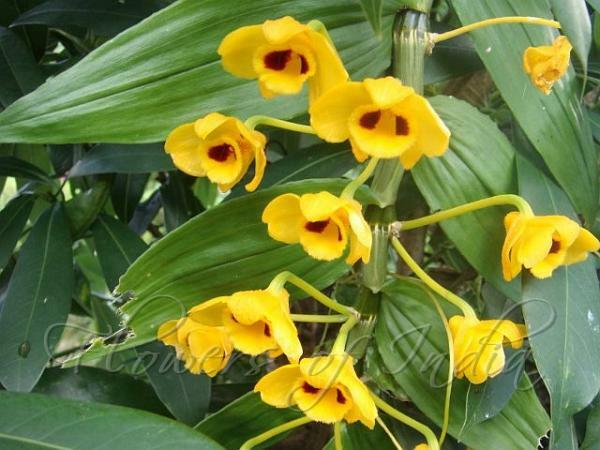 Golden Flowered Dendrobium is a large sized, cool to warm growing epiphyte, lithophyte on limestone cliffs. Its is widespread through the Himalayan foothills of the western Himalayas, Assam India, China, Nepal, Bhutan, Sikkim, Myanamar, Thailand, Laos and Vietnam in humid, mossy, mixed and coniferous forests and primary, broadleafed, evergreen, lowland forests at an elevation of 350-2200 meters. The plant has pendulous, many noded, grooved stems. to 5 ft long. These stems carry ovate-lanceolate, acuminate, bright shiny green leaves. 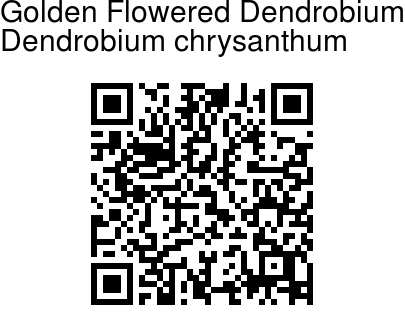 It blooms from April till November on an axillary, very short, opposite of leaves, few to several flowered, racemose inflorescence that arise on the nodes on the upper portion of an immature leafed psuedobulb. The inflorescence arises opposite of the leaves with 1 to 3 fragrant, fleshy flowers. This species is best placed in a wire basket with well draining media to accommodate their pendant growth habit.